Albeit HP not pushing out any more HP TouchPad offerings, if you like HP tablets there is a new one on its way called the HP Slate 2, which apparently is a business centric tablet that runs Windows 7, and we have a little unboxing video of the HP Slate 2 for your viewing consideration below, albeit the device is a prototype. The HP Slate 2 unboxing video comes our way courtesy of the guys over at Ubergizmo and by way of the YouTube page for Hpbizanswers and delivers just over three minutes of unpacking and getting to know the HP Slate 2. 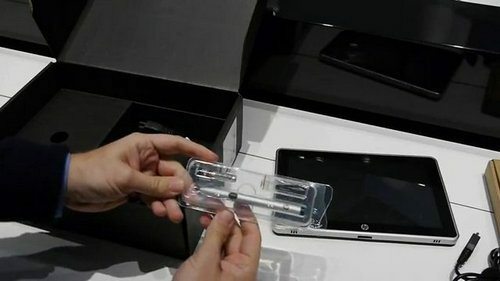 The video shows basically what you can expect if you purchase the HP Slate 2 although the guys does say a case is missing that will come with the final product one it hits the streets. Spec wise the HP Stale 2 offers an 8.9-inch touch screen, 1.5 GHz Intel Atom Z760 processor, 32bit Windows 7 operating system, 2GB RAM, rear and front facing cameras of some description, USB 2.0 port, WiFi, optional 3G, digitiser pen, headphone jack, 30Whr battery and weighs in at 1.5 pounds. The HP Slate 2 also comes with a handy dock stand with 2 USB posts, HDMI out and headphones out ports, and enables you to charge the slate or play out to your TV or monitor. Now for that all-important price, the HP Slate 2 is expected to hit the United States later in the year commanding a price tag of $699, whilst the UK price for the tablet has yet to be confirmed. So there you go, all you need do now is head on down and mash that play button to check out this unboxing of the new HP Slate 2, which was done at the HP Experience centre in Bracknell, which isn’t too far from where I live…enjoy. I don’t think the Slate 2 “comes with” the dock, that’s extra on the basic price, unless they’re being nice to early orders.Â The stylus, as an alternative to touchscreen,Â also may be a separate purchase (I think it comes with the dock or with the case, unless someone mangled one of the descriptions I read).Â Setting these points aside, I think I want a Slate.Â But Dell’s Latitude ST tablet is very similar; doesn’t include Swype keyboard, though (I prefer to use something called Fitaly anyway), and is more expensive, especially in Europe.Â (Depending on HP’s European price. )Â But the stylus is definitely included.